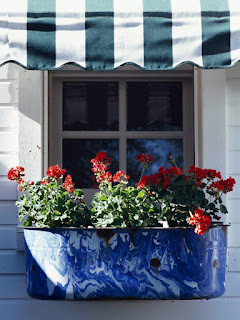 Because true blue is so difficult to find in nature, search for containers that fill the role. 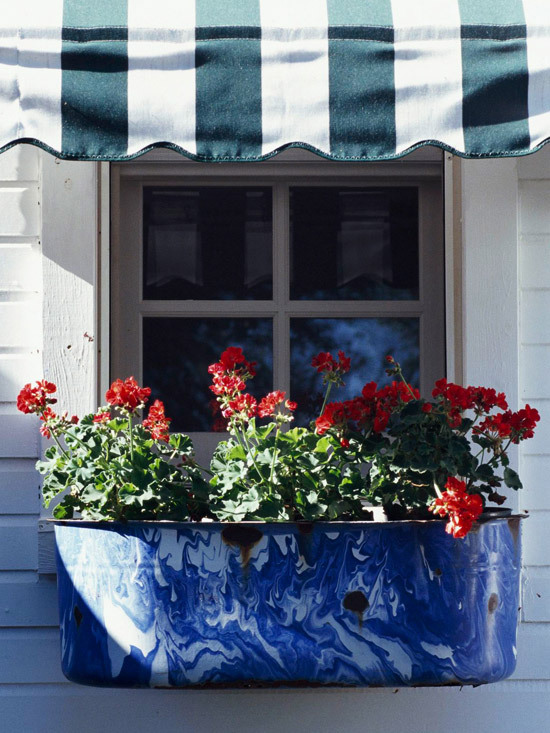 This enameled metal tub in blue and white is a perfect foil for red annuals such as geraniums or petunias. Be sure to drill holes in the bottom of the tub to allow drainage and prevent the window box from becoming too heavy. Table decorations in red, white, and blue make a fabulous seasonal celebration. 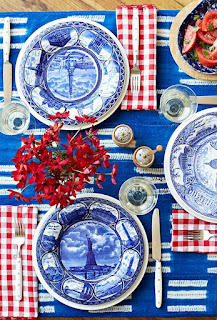 Ground each place setting with blue denim place mats, strips of striped ribbon, and bandana napkins. Top stacked blue and white plates with enameled red buckets lined with map-printed paper, and fill with soft rolls or baguettes. 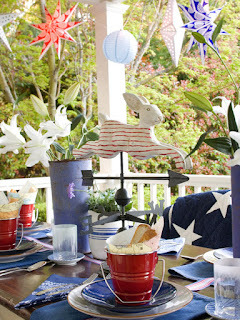 A jaunty red-and-white rabbit weathervane makes a charming folk art centerpiece when flanked with white lilies in blue sap buckets. String pierced paper lanterns on a multisocket lantern cord, and suspend from the porch ceiling with cup hooks. 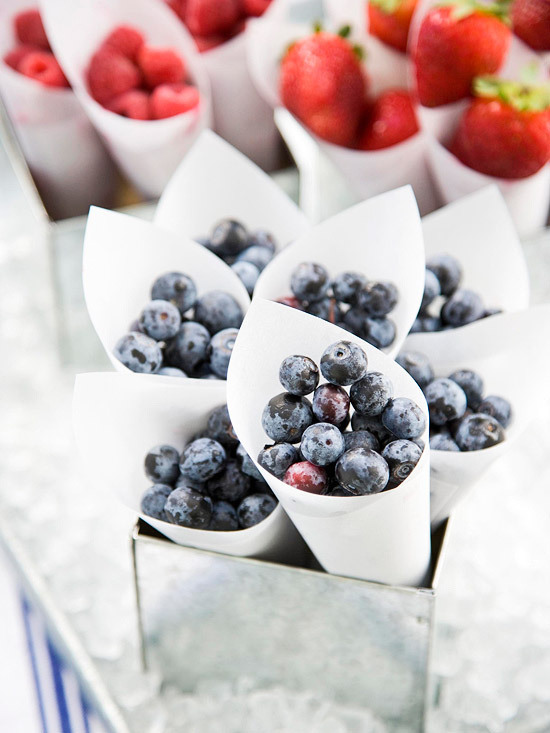 Serve a simple snack or dessert at your gathering that fits in with your red, white, and blue theme. "Simple helpings of fresh-picked red raspberries, strawberries, and blueberries work just as well as a snack for the kids as they do for an elegant dessert with friends," Yoest says. 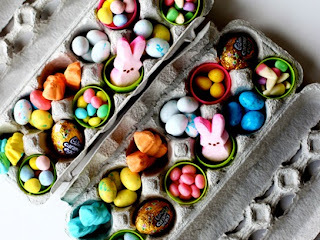 Serve them in cones made of rolled parchment with whipped cream on ice for dipping. 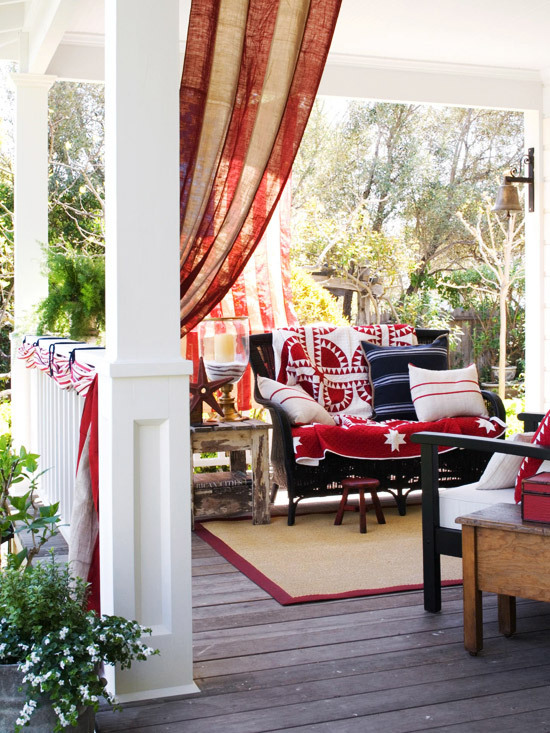 Layered in red, white, and blue, any outdoor space becomes patriotic. Set the scene by hanging a flag (hang the blue field at the top left as it is viewed from the street or yard). 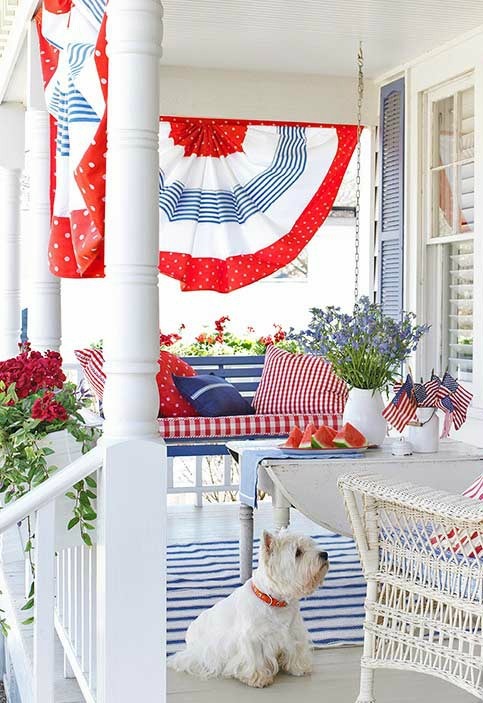 Striped fabric, gathered and tied to the porch railing with heavy blue yarn, recalls classic bunting. Decorate your porch or patio like a permanent fireworks display. 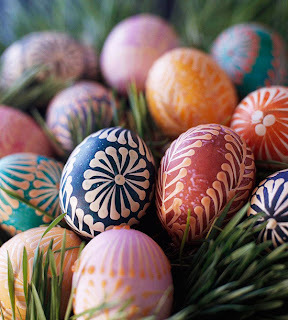 Attach painted metal stars to the house front or fence, and drape a table in a star-spangled tablecloth. 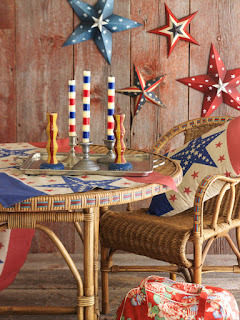 Toss star-printed pillows on the chairs, and accent the table with red-, white-, and blue-stripe candles that look like Roman candles ready to explode into a sparkling display. 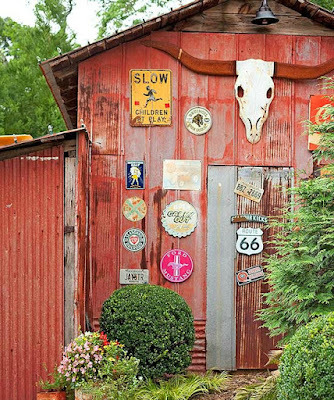 When it comes to 4th of July yard decorations, you can't beat a classic. 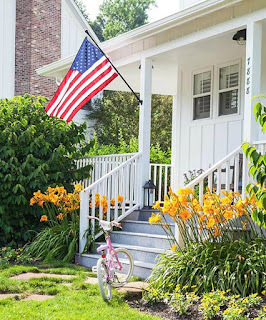 There is nothing more beautiful than an American flag hanging on the side of a barn or off the corner of the house, especially during the summer holidays. Textiles provide all the colorful punch on this pretty porch. A striped rug, pillows, and colorful cushions perk up the all-white space. 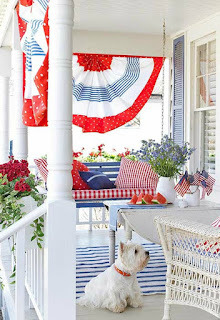 Emblematic red, white, and blue bunting billows from the porch ceiling to take the color scheme all the way to the roof. 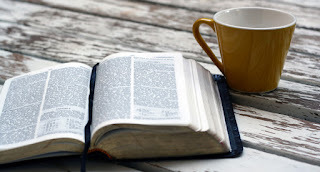 Pack away the plastic tablecloth. 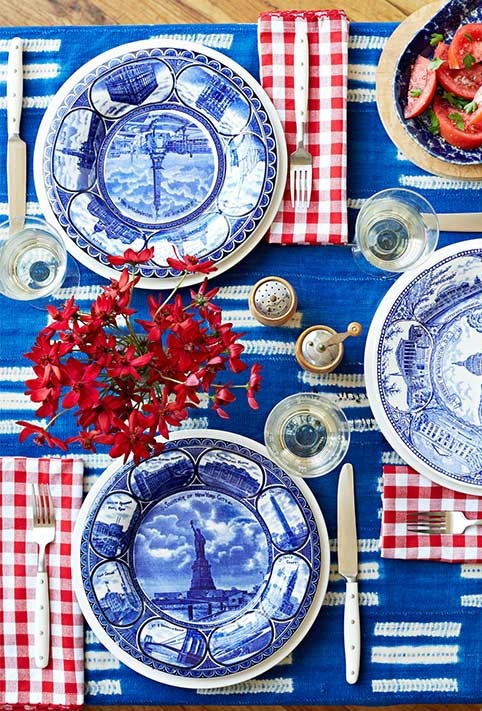 Picnicware reaches new heights with patriotic patterns and bright colors. 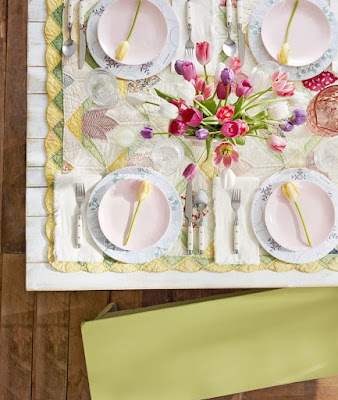 Look for secondhand tableware at thrift stores to make your celebration cost-effective and one-of-a-kind.